These sets with magnetic letters or numbers contain 2 magnetic sheets in A4 format with punch-out letters and punctuation marks or numbers and special characters. The letters and numbers are printed black on white background and the font size ranges between 17 mm and 21 mm. 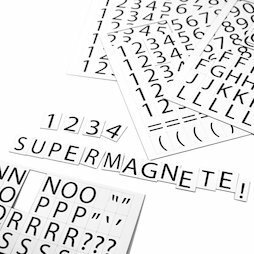 Magnetic letters and numbers work well on whiteboards, planning boards or for labeling metal shelves. They also adhere to all sorts of other metal surfaces. 10 pcs. 0,65 EUR ea. 1 pc. 29,90 EUR ea. 10 pcs. 0,48 EUR ea. 10 pcs. 0,26 EUR ea. 1 pc. 5,85 EUR ea. 1 pc. 24,99 EUR ea. 1 pc. 134,95 EUR ea. 1 pc. 11,80 EUR ea. 1 pc. 149,98 EUR ea. 1 pc. 19,99 EUR ea.